Looking for Roof Repairs in Yackandandah? 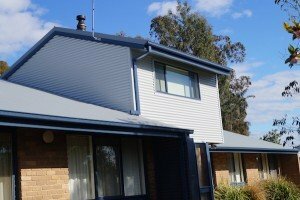 At Big River Roofing we are specialists in all types of Roof Repairs in Yackandandah including commercial buildings, houses, garages and sheds. Quite simply if it has a roof and needs repairs, maintenance or replacement then we have highly qualified expert staff ready to assist you. No matter what the roof or what it’s built from we can fix it! So if you live in Albury then contact us today on 02 6024 7792 to arrange an obligation free quote and to discuss your roofing needs in more detail. One of our highly trained staff members will be more than happy to help. We have years of experience in repairing all types of wind, storm and water damage. Plus we have a team of roofing experts that specialize in maintaining the condition of your roof through de-mossing and making sure the roof is water tight and safe. We have been servicing roofs since 1993 in the Albury Wodonga, North East Victoria and Southern NSW areas.